Building on our expertise in product engineering and prototyping, Rapid Designs has become a world leader in rapid tooling. Our services are distinguished for utilization of the most advanced concept/bridge, prototype and low-volume rapid tooling processes, and materials in the creation of tooling through applications of high-speed CNC machining, and stereolithography. Rapid Designs has set new standards for rapid tooling in a variety of industrial and consumer product applications. Rapid tooling continues to offer opportunity for discovery. During the mid '90s when the phrase “Rapid Tooling” was first used, it described any method that would replicate an injection mold to manufacture a physical plastic or metal part. The name was coined as an extension of rapid prototyping. Rapid tooling included the development of rubber molds, plaster molds, ceramic molds and metal molds. Today, advanced technologies, processes and business practices are the foundation upon which rapid tooling is no longer dependent on prototype models and has become an established practice in widespread applications, saving manufacturers considerable time and money in product development. The search for a cost and time effective tool-making process was not born of rapid prototyping. It is not a product of the '90s. In fact, cast composite tooling resin systems, spray metal, cast metal, sintered metal molds (3M Tartan process) pre-date CNC. Rapid Designs started using these processes for mold making in the late '70s. These processes standing alone are no more or less rapid today than twenty years ago. What has inspired this new wave of innovation is the rapid prototype model. What has fueled financial investments into technology driven mold-making techniques is the need for faster development processes. An increased awareness of the benefits derived from aggressive prototyping in the development process, has given rise to demands for better quality and performance from rapid tooling processes. The thrust behind this innovation is the need to compress product development time. The engine is the 3D CAD solid model. The fuel has been solid free-form fabrication systems (SFF), and the wheels are new business practices (agile manufacturing paradigms). Rapid Designs has long prided itself in its staff's knowledge and ability to qualify a client's requirements and expectations. 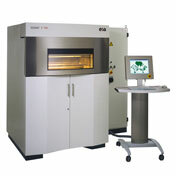 Our knowledge, experience and industry insights provide unique expertise in multiple mold-making processes. Rapid Designs sales and technical associates, having a strong mold-making knowledge base, coupled with broad knowledge of the fundamentals of many plastic and metal manufacturing processes. They can offer our clients a unique suite of solutions to solve their time-compressed product development and manufacturing challenges on a one-stop basis. Rapid Designs has 30 years of prototype tooling experience. Today our success is made possible by melding high-speed CNC machining technology, integrated CAD/CAM automation with revolutionary tool making processes and business management practices. A cultural storm transforming customer 3D digital CAD data into injection molded parts using human, artificial and mechanical intelligence has made us leaders in on-demand injection molding with superior precision and quality. Significant advantages have been realized in speed and quality using our proprietary polish-less and EDM-less rapid tooling process. From almost the beginning of Rapid Designs 40 year history its founders realized the value of their company’s skill sets would be measured not by the tools and skill sets they possess but by the quality and reliability of their deliverables. Today our mission is to utilize rapid tooling processes that enable our client’s time and cost savings without jeopardizing part design intent, part quality or production material selections. Metal tooling, aluminum and pre-hard steel, are without question capable of meeting the rigors of engineering materials and processing parameters. The challenge for non-metallic rapid tooling is to meet the same demands. 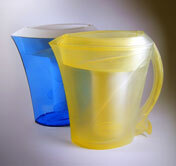 In 2004 DSM Somos enlisted Rapid Designs to beta test a new line of reinforced SL resin materials. This new line of DSM Protofunctional® reinforced SL products beginning with ProtoTool 20L™ and NanoForm™ have eclipsed all previous efforts to introduce a disposable class of rapid tooling. Our team of expert mold makers have designed tools and mastered processes to perfect this cutting edge rapid tooling solution. Rapid Designs enthusiasm has resulted in numerous SL rapid tooling successes but not without trial and error. In 2006 DSM Somos developed its 3rd generation of ceramic reinforced composite SL resin and again enlisted Rapid Designs as a beta test partner. It was an immediate success with our mold-makers. Our first tool using this advanced composite yielded a part 9.87” long (250.7mm). This was accomplished on Rapid Designs 3D Systems Viper Si SLA system. 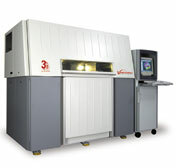 This SLA rapid prototyping system has a build capacity of 10” x10”x10”. It was selected because of it’s .002”/” accuracy. The following table charts a comparative cost analysis of NanoTool™ vs HS CNC machined aluminum. This rapid tool project was done in August 2006. New composite photopolymers continue to be developed by resin manufacturers. These new resin systems are reinforced ceramic composites introducing nano-scale particle sizes. Composite resins offer enhanced stiffness and high heat deflection temperature (HDT 250oC) over unfilled resins, together with low shrinkage and ease of processing. New applications opportunities are promising. Rapid Designs continues to pioneer SLA composites for rapid tooling and improved engineered part applications. To learn more about reinforced SL composite rapid tools contact one of our Program Development RP Specialists. Beginning with your 3D CAD digital part data one of Rapid Designs tool engineers will review and evaluate the DFM (design for manufacturability) of your part. Our engineers will consider the deliverable requirements against stated specifications. Recommendations will be made to improve the design or possibly simplify to save cost and time. When possible Rapid Designs inventory of standard M.U.D. (Master Unit Die) quick change mold bases will be used to save you cost and reduce production time. After receiving your order your rapid tool will be assigned to one our senior mold makers. Each mold maker receives annual advanced training in Mastercam and 3D solids. Your 3D CAD model will be brought into their CAD system to begin the tool design process. Typically tool designs and CNC tool path programming are completed in the first day. If reinforced SL composite rapid tooling is the selected rapid tooling option the cavity and core molds will be ported to our SLA machine for processing. Using Rapid Designs proprietary polish-less and EDM-less rapid tooling processes the tool is designed to optimize high-speed CNC machining to eliminate time consuming post polishing and EDM machining. Applying our programming standards of excellence accuracy of final cavity geometry is superior to traditional tool making methods. Our standard tooling quality assurance begins when our estimator reviews your part and production specifications. During the 3D tool design process our team examines the design before machining begins. Machined mold components are inspected during the mold production phases heading off possible delays resulting from in-process errors. Tool tryout is accomplished by using one of our Arburg injection molding presses. Customer specified molding resins are on-hand and pre-processed to insure the timeliness of the tool tryout. Parts are processed to the resin manufactures recommended parameters. Samples are then inspected to one of our four standard inspection levels. Our standard inspection is Level 4 unless otherwise requested by our client. Twelve (12) first article samples are then submitted with an inspection report for the customer’s review and mold approval. Certificates of compliance (COC), material certifications and first article inspection reports are standard business practices and included with every project. Rapid Designs Rapid Tooling value is defined by the quality of our product, repeatability from part to part, attention to detail, problem solving, researching new materials and processes, investment in technology, experienced mold-makers and sales associates, injection molding manufacturing expertise, rapid quotes, rapid delivery and a superior second-to-none customer service. We are committed to in-process testing, inspection and measuring our performance. Customer feedback is encouraged and solicited to insure we are constantly improving our processes and business practices. Time proven — repeat performance has allowed us to earn the coveted position of a being chosen as a strategic partner to many of our clients. We strive for unrivaled excellence. On time, every time – Zero defects. Click Here to Contact Rapid Designs for further assistance with your Rapid Tooling needs.